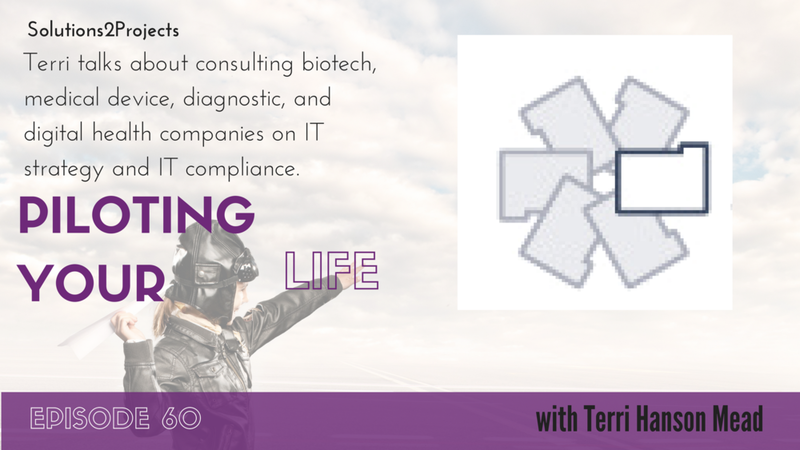 Terri talks with Jacqueline about her work consulting with biotech, medical device, diagnostic, and digital health companies providing IT strategy and IT compliance services. Terri and Jacqueline start out with some discussion about end of school year and the beginning of summertime. Terri talks about her consulting work with Solutions2Projects and that she is still consulting, despite a recent comment by someone that they didn’t realize she was consulting. Terri started her consulting company, Solutions2Projects, 13 years ago. Terri does higher level IT strategic and compliance work within biotech, medical device, diagnostic, and digital health companies. This has included IT strategy, IT compliance, IT system selection, IT project management, and vendor audits within life sciences companies. Terri works with companies that have 30-300 people, moving towards or in Phase III clinical trials and/or getting ready for market approval and commercialization. Terri likes to come in during Phase II to help the companies plan out their IT strategies in advance of when they need the systems in alignment with their corporate strategies. Terri talks about how biotech companies outsource certain systems and processes early on and then later decide to bring in house and how the planning for this should be aligned with the corporate strategy. Terri talks about computer validation and 21 CFR Part 11 (electronic records / electronic signatures) in an FDA regulated industry. Terri works with systems and processes across an organization including clinical, regulatory, quality, financial, manufacturing, distribution, quality, HR, payroll, budgeting, business performance management, lab systems, etc. Terri is a business person who understands technology and compliance. Solutions2Projects’ value is in considering business, technology, and compliance requirements and needs. Terri talks about the importance of data integrity in life sciences and how we use computer validation to demonstrate data integrity and control over the data and the systems. Terri talks about the challenges associated with the introduction of SaaS in life sciences. Jacqueline asked Terri about her first system selection and validation. Terri talks about how she fell into life sciences a year after the 21 CFR Part 11 regulation was released (1997) and her first implementation and validation of JD Edwards at Coulter Pharmaceuticals following GAMP4. GAMP5 has since been released and computer validation has evolved over the last 20 years. Terri is a believer in taking a risk-based approach to computer validation and tailoring to each company’s risk tolerance and approach to the system. Computer validation is all about defining what you want, testing to confirm you got what you wanted, training people to effectively use the system in a consistent manner, and then maintaining the system in a controlled manner. To Terri, this makes good business sense. Terri talks about the evolution of computer validation and some project and client stories. Terri shares her concerns about potential litigation in the life sciences space between SaaS companies and life sciences companies because of computer validation and potential exclusion of data from regulatory submissions or complete response letters. She is starting to see more warning letters and 483’s around data integrity. Terri talks about blockchain in the life sciences space. Solutions2Projects is ideally suited for situations where this is an internal lead or project manager and Terri provides guidance, structure, and templates to help them with their processes. Terri can help guide the business through the changes related to the new system implementations. Terri has some project managers she likes to work with whereby she plans the project and then they are able to manage the projects with high level advisory and guidance from Terri. Everything comes down to process and technology. Terri’s favorite part of her work is to aligning corporate strategy with the system strategy. When she can help life sciences companies see systems as business enablers and meet compliance requirements she is a happy camper. Jacqueline can be reached through her website at https://www.jacquelinesteenhuis.com/ or via Twitter at @andYoureaGirl. You can follow Terri on Twitter at @terrihansonmead or go to her website at www.terrihansonmead.com or on Medium:  https://medium.com/@terrihansonmead. Feel free to email Terri at PilotingYourLife@gmail.com. To continue the conversation, go to Twitter at @PilotingLife and use hashtag #PilotingYourLife.